This date in 250 is the feast day and traditional martyrdom date for Pope (and Saint) Fabian(us). For when all the brethren had assembled to select by vote him who should succeed to the episcopate of the church, several renowned and honorable men were in the minds of many, but Fabianus, although present, was in the mind of none. But they relate that suddenly a dove flying down lighted on his head, resembling the descent of the Holy Spirit on the Saviour in the form of a dove. Thereupon all the people, as if moved by one Divine Spirit, with all eagerness and unanimity cried out that he was worthy, and without delay they took him and placed him upon the episcopal seat. Fabian seems to have been a competent administrator and had the luxury of occupying St. Peter‘s throne during the lull in persecutions under the Roman Emperor Philip the Arab. If you like the highly speculative hypothesis that Philip was not merely sympathetic to Christians but actually a Christian himself,* then Pope Fabian is probably the guy who baptized him. But uneasy is the head that wears the crown, and never more so than during Rome’s Third Century Crisis. In due time, the ambitious Senator Decius toppled Philip, and implemented loyalty oathssacrifices to Roman’s pagan divinities. Fabian paid the piper for those years on easy street with Philip by refusing to make the requisite sacrifices and delivering himself to a demonstrative** martyrdom in January 250. A Greek epitaph — “Fabian, bishop and martyr” — has been discovered in the catacombs. 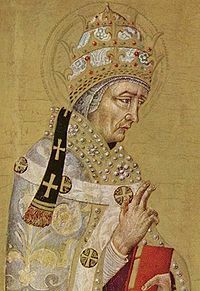 With the surly Decius hovering around to lop off the next Roman head bold enough to submit to a bishop’s cap, the papacy stood vacant for more than a year before (with Decius out of town on campaign — for good, as it turned out) said papacy made up for lost time when it was claimed by two men set at loggerheads by the persecutions themselves: the little-known caretaker Cornelius (the Church’s official successor) and Novatian (the schismatic antipope). The always recommended History of Rome podcast deals with this period in episode 110. * If Philip the Arab was Christian, then he would displace Constantine the Great as the realm’s first Christian ruler; the faithful might regard the transfer of that distinction as a downgrade.